"like you’ve entered an alternate universe"
It's easy to be cynical about the trend of jukebox musicals, which arrive in the West End in chirpy droves, but it would be wildly inaccurate to paint Jim Steinman's venture with the same brush. Bat Out of Hell the Musical is no ordinary musical theatre; it's a stadium rock concert come epic tribute act, based on Meat Loaf's 1977 concept album. It's the best worst thing I've seen for ages. Clearly, the producers have upturned buckets of money on production values; there's pyrotechnics, confetti canons, huge video screens and a car that falls into the orchestra pit. If this show has been in the works for a long time, it's obvious that the team want to do it justice. Set in a very Tim Burton-esque dystopian future, designed by Jon Bausor, the musical follows the somewhat convoluted story of Strat and his gang, otherwise known as “The Lost”. Sometime ago, the teens were caught in a toxic explosion that caused them to freeze at eighteen years old – very Peter Pan. The evil Falco's daughter, locked up in their high-rise apartment, catches Strat's eye, and that's that. Any substance goes out of the window and the show transforms into an epic, ballad-packed extravaganza. Director Jay Scheib does a good job ensuring the action is pretty pacey. You have to put aside your qualms for the most part; it reads like a bad cult film at times, and Meat Loaf's songs don't always make for the best story. But for the first half, you are certainly far from bored. It’s only when the second act drags on (cue some very dubious acting) that you begin to feel slightly like you’ve entered an alternate universe. Much of the pizzazz is unfortunately hindered by Emma Portner's incredibly static choreography, which seems to involve a lot of arm movement and not much actual dancing. There’s room for bigger numbers, but luckily the vocal arrangements save the songs, and the quality of the vocals is truly mesmerising, particularly from Sharon Sexton as Sloane and Danielle Steers as Zahara. Andrew Polec, who makes his debut as the angsty Strat, and the velvet-voiced Christina Bennington as a tempestuous Raven are a good choice for leading lovers. They have an electric chemistry and their vocals blend beautifully. In fact, the entire ensemble are incredibly strong. It's been commented that Bat Out of Hell is a revolution in musical theatre – it's not, because it's not really musical theatre. If you're a Meat Loaf fan, it's one massive tribute act to a musical legend. If you're not a Meat Loaf fan, it's a very bizarre, but more interesting version of Thriller Live. No, the show doesn't make a whole lot of sense and some songs are painfully shoehorned in. 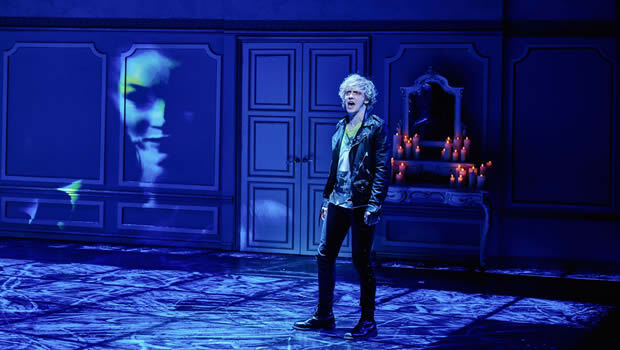 But the cool effects, including Finn Ross' video design, paired with an ensemble that go hell for leather ensure that this batty musical is one hell of a ride.